As anyone who cares for plants knows, it can sometimes be frustrating waiting for nature to make things grow. As a nonprofit that has been operating for only a few years, most of the trees we have planted are still small and spindly things that, despite all their potential, are several seasons out from bringing in a bumper crop. So when we have a chance to work with community members who have large, old, fruit-bearing trees, we jump on it. What better way to learn about shepherding our little guys into blossoming old age? This spring we learned that we would be allowed to steward and harvest the 5 acre, 2,000 (!) tree Genesee Orchard property in Parkton, and we couldn’t wait to get out there. But there was a reason that the orchard had been handed off to us – it had been effectively abandoned for twenty years, and had grown into a tangled morass of dead wood, weeds, and (gasp) the most poison ivy we have ever seen. In 2013, we began working at the Genesee Orchard harvesting pears. The pear trees were small and well-spaced, so bringing them back into healthy production with some pruning and weeding wasn’t too much of challenge. But the apple trees, which are packed together and all at least 15 feet tall, were a different story. Millstone Cidery were doing their best to resurrect the trees in the hopes of using the apples. These trees had never been treated with industrial fertilizers or pesticides, so the fruit was funky. That didn’t bother Millstone – it was headed for the press anyway. Plus, these apples were the most organic of the organics – a little too much so, as it turned out. Millstone decided it was beyond their capabilities as a business to care for such a massive project, and told us that they would not continue caring for the orchard in 2016. That’s where we came in. From our time working in the pear orchard, we knew that the Genesee Orchard had much to offer. We even rechristened it the Ben Howard Orchard after our Program Director-emeritus. 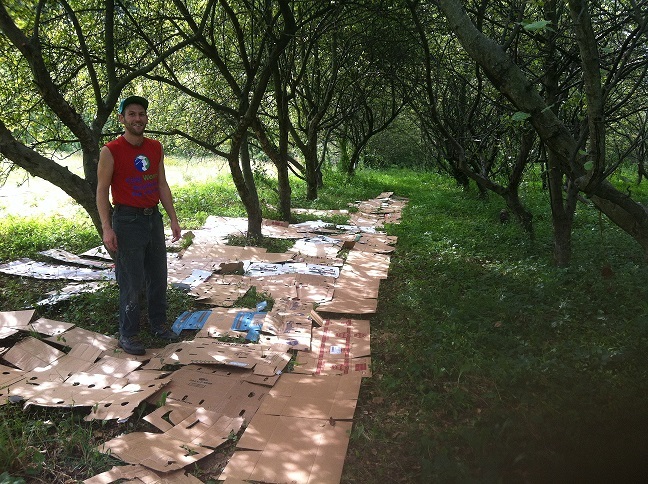 Here was an opportunity to do work in a full-grown orchard that was originally intended for commercial production, and hone our skills as fruit tree stewards. We knew that we could get a good amount of fruit from that many trees, and funkiness doesn’t bother us either – in fact we seek it out. As a nonprofit, we had no bottom line to meet, as long as we used the orchard to fulfill our mission of spreading fruit tree love, information, and harvests to the Baltimore community. In July, we began taking weekly trips out to the BHO. With our heads full of ideas, we developed a plan – we would tackle one edge of the orchard where the trees seemed to be bearing best, with the goal of increasing production in that area by next year. The trees had been planted far too close together with the intention of maximizing harvest yields in the early years while they were still small. But after being abandoned for so long, the trees had grown to full-size without proper care. Some were dead, many were dying. As much as we hated to do it, we knew that half of the trees had to be removed. What followed were a series of sweaty days cutting down trees and pruning dead wood. 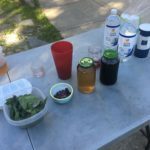 We were surrounded by poison ivy and rampant weed growth on all sides, though with extreme caution, extensive scything, and paranoid fits of crazed scrubbing with dish soap during breaks, we kept exposure to a minimum. We also began to lay a path between the trees using cardboard donated by Gather Baltimore and mulch provided by TreeBaltimore’s Camp Small. In the weeks to come, we want to try and establish a cover crop of red clover and vetch to further suppress virulent weeds and poison ivy so that our volunteers can more easily work in the orchard without worrying about being exposed. As the weeks passed, fresh sunlight trickled through the branches where there was once thick shade. The apples themselves, though not quite the shiny red beauties of the grocery store, were developing nicely. We made slow but steady progress, laying the path and cleaning up a row of about 20 trees. Alas, we did come to the same realization as those who came before us: the orchard was a massive project that we could never hope to tackle in its entirety. With our small staff and limited resources, we could only do so much. But we knew that if we could get only a handful of trees into decent production again, we could get fruit for hundreds of people back in the city. It also came to be a little luxury to work in the orchard at the end of every week, despite the heat and strenuous labor. Nothing soothes the soul better than some hard work in a beautiful place – it’s this peaceful energy that we are trying to bring to the city through our work. At the end of each day, we would take a dip in a nearby river to cool off and do our best to get the poison ivy off us! We fully intend to stick with the Ben Howard Orchard as long as we feel we are making progress there, if only for the pear trees, which are as nice as those in any noncommercial orchard in this area. Stay tuned on our Meetup page for a harvest at Genesee in the coming weeks!